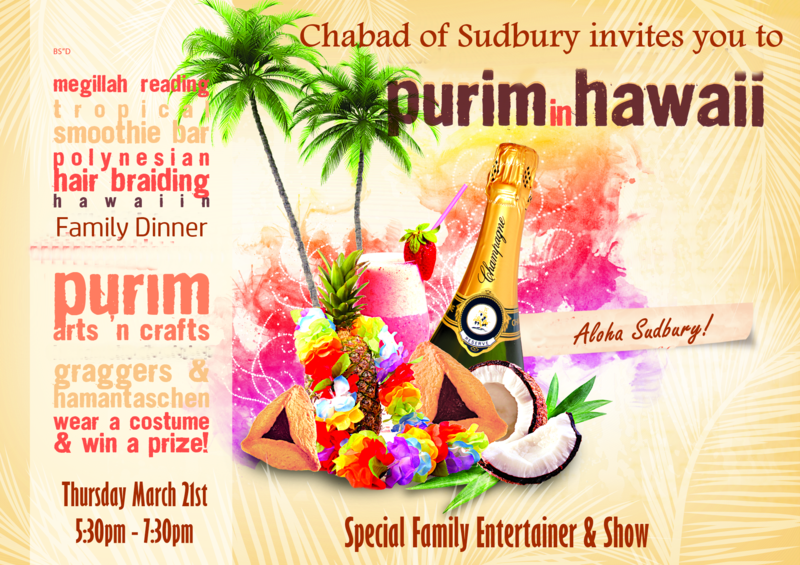 The Chabad Center of Sudbury invites you to join us for an awesome Hawaiian themed Family Purim Celebration on Thursday March 21st. Enjoy an awesome show that will entertain the entire family while you enjoy Hawaiian cuisine and ambiance. an Interactive Megilla Reading along with a Multi Media Presentation. The event and dinner will start at 5:30pm and continue through 7:30pm and will be held at the Chabad Center of Sudbury. Fee: Suggested Donation $10 Per Child $15 Per Adult or $50 per family. Feel free to share and invite your friends to this event which is geared to the entire family. Separately, on March 20th we will be having an exclusive Purim celebration for Adults with a unique show from a Mentalist and featuring wines and horderves.